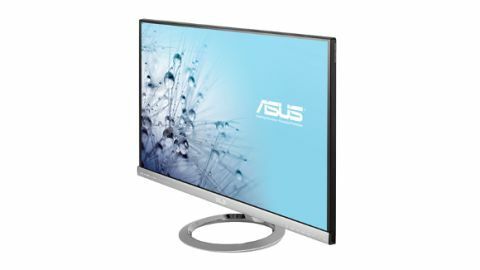 As ASUS continues to branch out into the sexier world of phones, tablets and hybrid PCs, there is still a place on computer store shelves the good old stand alone PC monitor. Perhaps aware that this isn't the most desirable vertical it is in, ASUS tries to spruce up the MX279 with splash of design. So much so that its marketing team have dubbed this series 'Designo', like a cape-wearing superhero on Queer Eye for the Straight Guy. The stand on the MX279 is a steel grey coloured circle; made to look like one of Apple's aluminium iMacs, without actually being made of metal. ASUS does a nice job of making the screen look bezel-less when switched off, with the panel being nearly as black without power as the plastic that surrounds it. Controls for the screen are found under the lower right-hand edge, where little plastic dimples house touch-sensitive buttons. These don't need to be touch-sensitive, of course; but it is a nice touch that adds to the feeling that this is a product of premium quality. Connectivity-wise, ASUS keeps things pretty simple. There are two HDMI ports and one D-Sub connection for VGA inputs. ASUS include an HDMI-to-DVI cable in the box with the monitor, but don't have a DVI socket on the monitor itself. If you, like us, now have several devices with wireless connection options; a laptop with Wi-Di, or a smartphone with Miracast, you will have to invest in an adapter to connect it to the MX279, as there are no such options here. In fact, if wireless is your thing, you'll need to check out Samsung monitors in this price range instead. Also missing are powered USB slots, which are becoming near essential with the limited inputs on today's Ultrabooks and MacBoor Air. Other monitors in this price range offer several USB ports and some include networking too, like an Ethernet port or Wi-Fi capabilities. What this monitor does have is pretty impressive audio, with Bang and Olufsen ICEpower speakers built along the bottom of the monitor unit. We tested out the MX279 with an Xbox 360 as out input, and though the sound isn't on par with a dedicated audio system, it is better than you'll get out of most laptops, and would do fine for someone gaming, or watching online videos, sitting close to the screen at a desk in a bedroom or study. Picture quality is only passable, though. With 1920 x 1080 pixels across its 27-inch panel, the picture does look a little soft and fuzzy to us. With a screen of this size, you should really be looking for a pixel count of 2560 x 1440, especially if you plan to spend your time reading loads of text on this screen. Colours are strong and well produced, if perhaps a little too strong. Especially on the pre-set Gaming and Theatre modes, where primary colours can bleed slightly, overpowering the texture in some images. The IPS panel does deliver good viewing angles, though. Even at acute horizontal angles, the images and text is still clear to see, and colours don't degrade too much. Likewise vertical angles are solid. For the price, you get a large, attractively designed monitor with pretty decent audio thrown in. But the resolution of the screen holds it back from being a great computer monitor, making it better instead for watching movies or gaming.